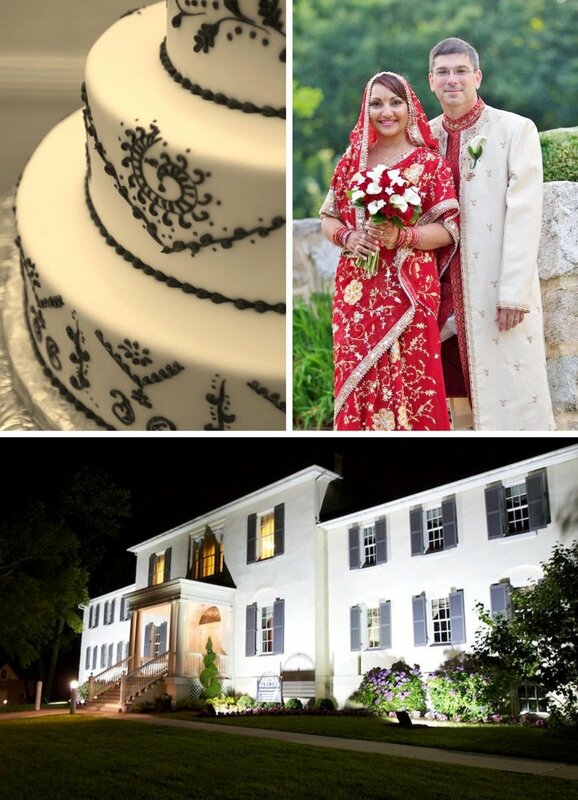 Last fall we received an email from a bride requesting assistance with her July wedding at Historic Oakland. We soon learned she was living outside of the county, so we made arrangements for a telephone chat a few days later. Rachel was stationed in Germany with the US Army and Russell her fiancé was stationed in North Carolina. We would plan this wedding without ever meeting the bride until the week of her wedding! Rachel was born in India but raised by an American family in the United States. 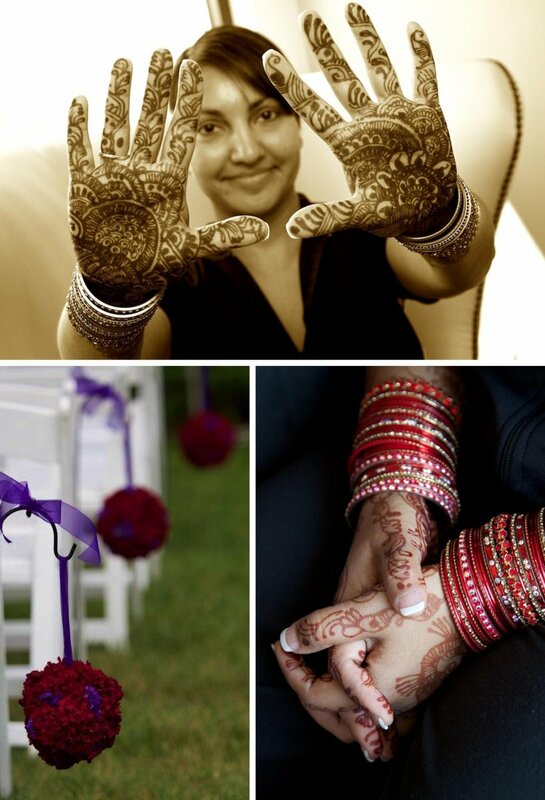 For her wedding, she wanted to incorporate some of her Indian heritage along with American traditions. Rachel’s favorite colors are red and purple. Her traditional Wedding Lehenga would be red and gold. A few months before the wedding, Russell was also transferred to Germany. Before Russell left the States, he traveled to Maryland for cake and menu tastings. Then it was back to email correspondence for the remainder of the planning. We would also periodically chat on the phone. Photos and descriptions of wedding cakes, flowers, invitations and other elements were sent back and forth. Linen swatches and paper samples were sent via mail. Finally at the end of June, Rachel returned to the States to prepare for her big celebration. We scheduled a quick wedding day review between her visits with family and friends. The final outcome of our long distance planning was a nice fusion of two cultures. Floral Impressions created beautiful red and white arrangements with a touch of purple. Table linens alternated between an elegant gold embroidered ivory taffeta and a gold embroidered red sheer. The menu was a mix of American foods catered by The Elkridge Furnace Inn and Indian dishes prepared by House of India. The cake was beautifully decorated with a dark red Henna design. Deejay Michael Valenti played mostly American classics, but also weaved some Bollywood tunes into his dance sets. Rachel’s July wedding day was a beautiful summer evening. 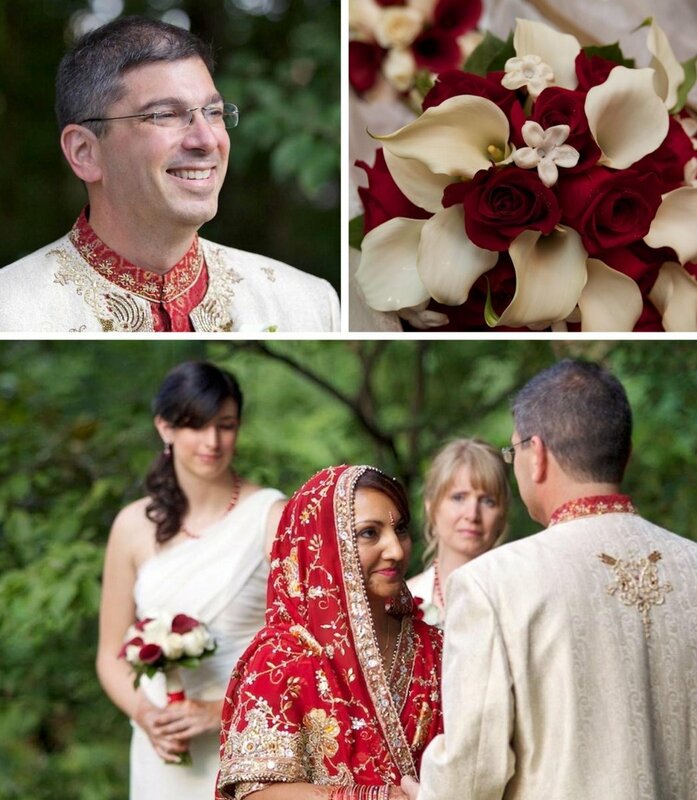 At promptly 6:30, Rachel’s father walked her down the aisle towards Russell who was dressed in a traditional Sherwani suit. They were married in a traditional Christian ceremony performed by the Pastor of Rachel’s family church. After their whirlwind nuptial visit, it was back to Germany where both Rachel and Russell continue to serve our country. Thank you, Rachel and Russell.